Tired of the traditional breakfast in bed? Over the cliché shirt and tie combo? Make Dad’s Day a little more rad. Have a picnic, take a walk or just relax outdoors—let Dad choose how he would most enjoy relaxing with the family. Plan a day of not planning. 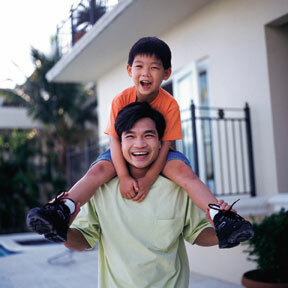 Make today the day to put aside all errands, chores and projects—help Dad to enjoy a pressure-free day. Father’s Day is not only for your children to celebrate Dad—let him know just how impressed you are with how amazing a father he is to your children. Give Dad the gift of a few hours by himself! We all need time to ourselves to refocus now and then. Dad may be thrilled to schedule an unexpected tee time, or to curl up with that new bestseller he’s been eyeing up. Don’t limit the father festivities to just your children’s dad; encourage your little ones to call their grandpas and other special male role models, too. Most importantly, let Dad know how appreciated he is. Help your children to write (or color) a thank you note, encourage them to create a special song or lend them a hand in whipping up a special treat. Homemade gifts or projects can sometimes be the best at conveying your child’s love and appreciation for Dad.